Ok, to be fair, the first 75% of this book was fairly interesting. The author supposes what might have happened if Bobby Kennedy would not have been assassinated, instead surviving the shooting and continuing to run for President. Written as more of a narrative, I found it compelling to imagine what that future might have looked like. Then, for some inexplicable reason, the author puts Bobby in the car that night in Chappaquiddick instead of Ted, and that’s where I had to stop. Why in the world would you change that up? Too ridiculous for me to continue. Honestly, I might have given this four stars if that had not occurred. The first 3/4 of the book was interesting enough that I still gave it two stars, but I can’t recommend this book to anyone in good faith. There are too many other Bobby books to read for this to warrant your time. The 1968 election was—and remains— spellbinding. Unlike modern presidential campaigns, where a dozen or more unknowns vie for debate stage sound bites, that year nine titans battled for the presidency. Fifty years later, most people are unaware that in a single race former Vice President Richard Nixon, California Governor Ronald Reagan, President Lyndon Johnson, Senator Robert F. Kennedy, New York Governor Nelson Rockefeller, Senator Eugene McCarthy, Vice President Hubert Humphrey, former Alabama Governor George Wallace, and Michigan Governor George Romney all squared off for the White House. The shocking assassination of Robert Kennedy on the night of his California primary victory left a gaping hole in history. and for five decades left this unanswered question: What if? 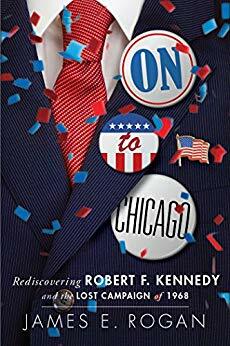 On to Chicago answers for history—based on facts, not on idealized or romantic notions—what likely would have happened if RFK had lived to go on to Chicago, the city that hosted the tumultuous 1968 Democratic National Convention. On to Chicago is a heavily researched and sourced work that twists the arc of history with facts that will appeal both to fiction lovers as well as pure history aficionados, because so much of it is true. With nearly one thousand endnotes online that confirm how much of this story mirrors reality, many revelations will surprise even the most dedicated history buffs. You’re a fan of RFK and you want to hear a ridiculous story about what might have been. Otherwise, just no.